Luxury garden statues add a grace to your outdoor space like nothing else can. 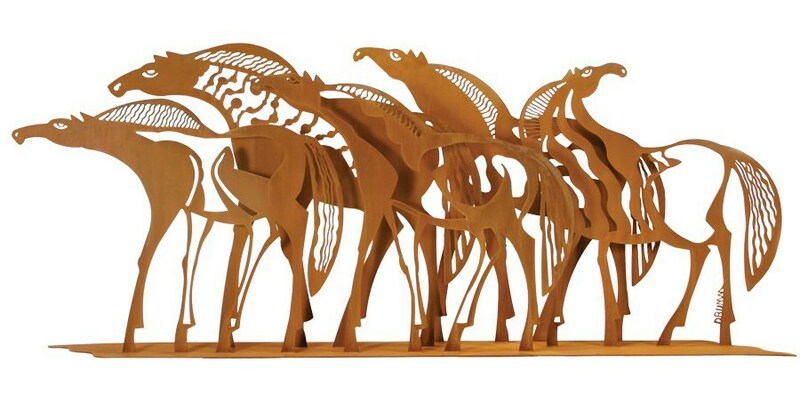 Experience the freedom and joy of wild horses with this Wild Horses Sculpture, ingeniously designed by internationally known sculptor Don Drumm to layer together to create beautiful shapes and shadows within the horses themselves. This unique sculpture stands at 48″ tall and breaks apart into two pieces which are also available for purchase separately. All 5 horses are 120″ wide, the 3 horses on the left are 86″ wide and the two horses on the right are 72″ wide. Finished in Corten Steel. Cricket Forge has partnered with internationally known sculptor Don Drumm to produce and market a special line of delightfully refreshing garden statues. 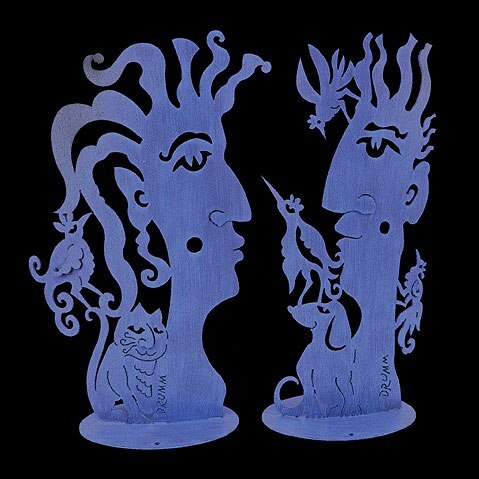 Take your choice of the whimsical man or woman’s head, or keep them as a couple! 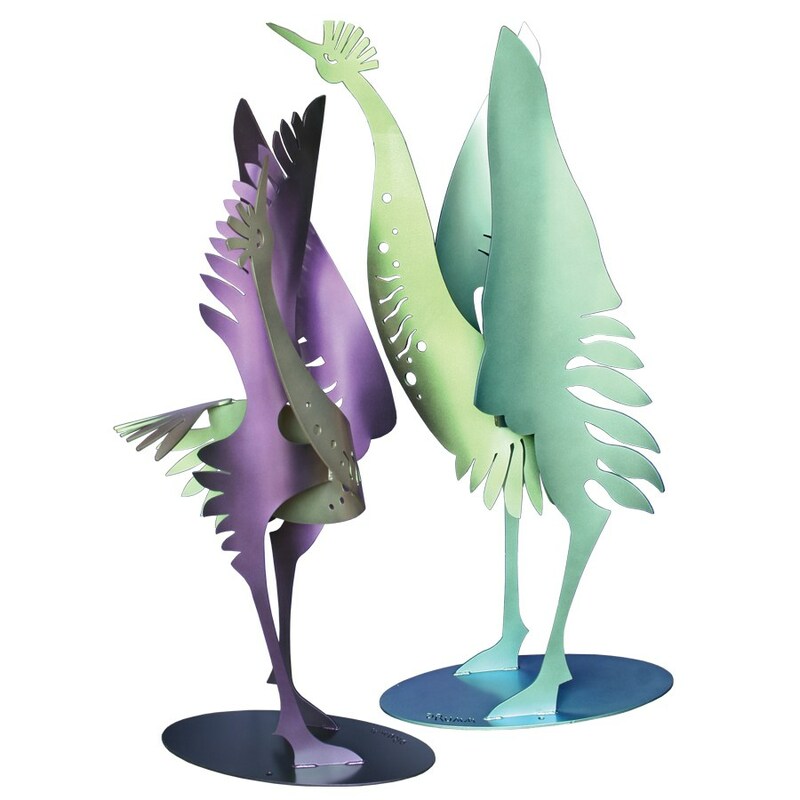 They stand 48″ high and make a delightful statement in your outdoor space. Finished in Periwinkle dry brush. Luxury garden statues add a grace to your outdoor space like nothing else can. The mesmerizing beauty of the crane’s mating ritual has inspired art since ancient times in cultures ranging from Japan to Rome to the Native Americans. Symbols of love, joy, life, happiness, eternal youth, and more recently a symbol of peace and the innocent victims of war, these Crane Statues are both meaningful as well as beautiful. Choose from the Straight Neck Crane or the Curved Neck Crane, available in Painted Color Shift which changes subtly from green to blue in the light. Luxury garden statues add a grace to your outdoor space like nothing else can. With our Sun Totem you can join in the tradition of so much of human kind that has paid homage to the sun, giver of life and light. 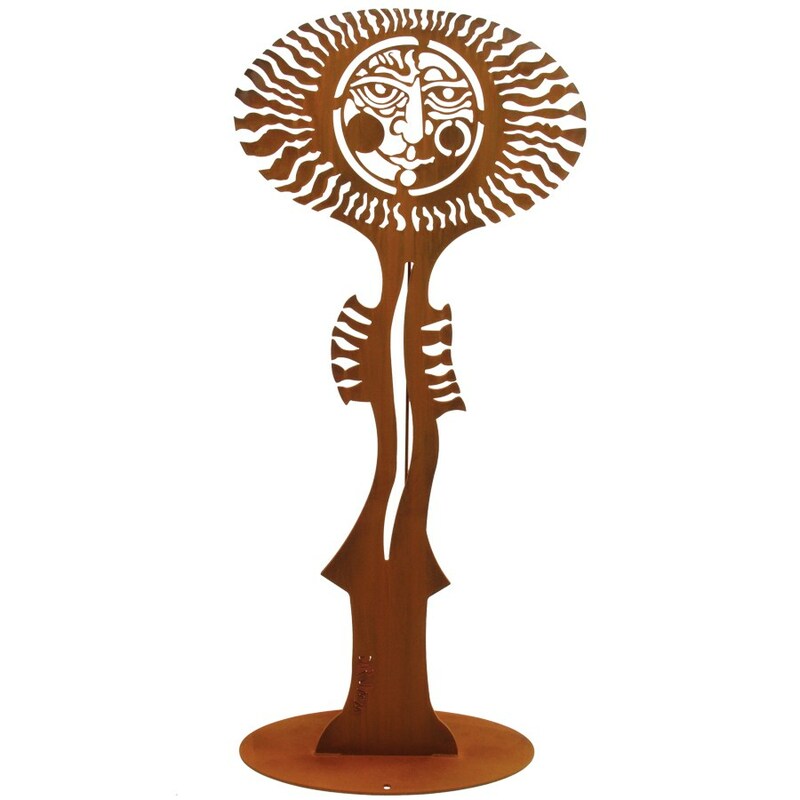 This sculptural Sun Totem is a unique and interesting interpretation of the sun’s allure. Measures 59"H x 24"W.
Shown in Corten Steel, we have one on display at Main Exhibit Gallery painted in bright yellow with orange and red accents.